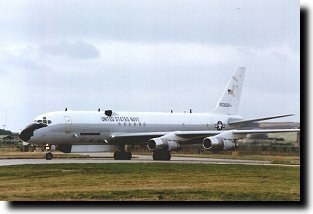 RAF Lossiemouth is located on the South-Western edge of the seaside town of Lossiemouth, about 5 miles North of Elgin, about 40 miles North-North-East of Inverness, in the Grampian region of Scotland. Home to Tornados mostly, it has the reputation of being the best station in Scotland when it comes to viewing opportunities. Tornado GR.4s (II(AC) and TWCU/XV(R) Squadrons) and Typhoons (1(F) and 6 Squadrons). 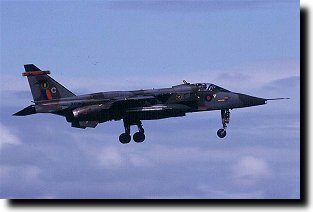 Visitors can include other Tornado and Typhoon units (e.g. 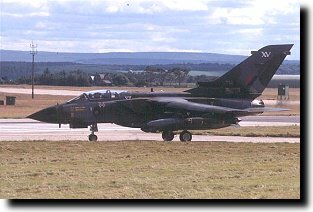 from Marham or Coningsby) and a selection of foreign visitors staging through Lossiemouth enroute to Europe or the USA, or exercising in the Scottish low flying areas. 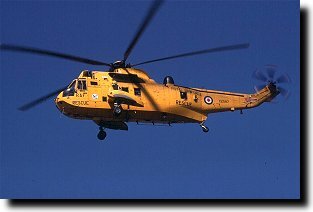 Activity can begin as early as 07:00 and goes on to about 17:00 to 18:00 unless night flying exercises are on; in which case there's no real telling how late flying will go on to - often to just before midnight but sometimes as late as 02:00. 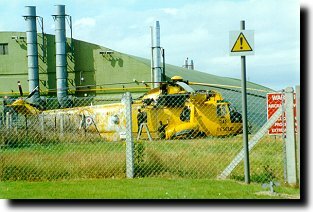 Lossie is normally very quiet at weekends with based aircraft tucked away in hardened aircraft shelters, but occasionally visiting aircraft may be left parked out in front of the large hangars by the control tower. Lossiemouth can often be very quiet on Fridays, especially after lunch - when many of the based aircraft are being hangared for the weekend. 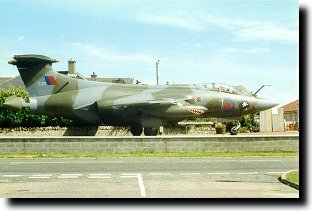 Assuming you're driving up the A941 from Elgin, you'd have to be blind to miss the Buccaneer service station on the edge of the town, which has an ex-Lossiemouth Buccaneer (XW530) on display! Inside the service station shop there is also a small display of Buccaneer photographs and memorabilia. At the very least you should fill your car up here and thereby help keep the Bucc in good nick! Continue up the A941 towards Lossiemouth but take the left turn onto the B9135 towards Kineddar. Then take the next left onto the road that skirts the Southern edge of the station. The road turns sharply to the right, straightens out, then turns sharply to the left. There's a lane leading to some houses and another lane leading to a crash gate (A) on your right - so go down there. The aprons in front of the main hangars, where visitors often park, is visible from here but too far for good photos. However if runway 05 is in use, any visitors taxiing out to take off will taxi past you here, and if runway 23 is in use, any landing visitors will taxi past you back to the hangars. Back down the lane to the road and turn right to continue going West - among some houses on your right there's another crash gate (B) with a layby leaving enough room for at least one car to park without obstructing it. The security cameras made me think they don't particularly want anyone hanging around here. Continuing on the road, you'll come to a crossroads, with a road going left and a lane to the right - this leads to another crash gate (C) so off you go. This lane is actually part of the old road, cut when the runway was extended. If you don't block the lane, you are left alone and the taxiway is within range of a 50-200mm class lens, with the sun behind you for most of the day. The runway end is not too far away and 300mm should get decent shots. If the mesh of the gate bugs you (swings and roundabouts - short tele's make harder work of mesh), just step to the side and it is a stranded wire fence (not chain link) alongside the field (but save it for when something is actually happening). Back to the road and turn right and you'll soon see the landing lights for runway 05 on your right. Find a place to park and can stand on the verge here (D) to get good side-on shots of anything landing on 05. Depending on where you park (numerous passing places and areas of verge are available), it may be a walk to get among the landing lights (E) or you may want to drive a bit further and park again, for those head-on shots and the usual end-of-runway experience! Turn right off the road to go around the end of runway 05 and you should be able to find somewhere to park to walk around the small fence at the runway end to get shots from the other side (F). 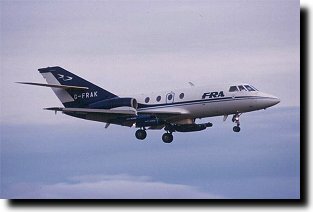 The sun is in your face for the morning and early afternoon but later in the day photos are no problem, with aircraft taxiing right past you within range of even small lenses if you stay near the road, and a noisier (and smellier) experience to be had if you have walked to the end of the runway. Back to the car and continue North on the road; it gets higher than the adjacent taxiway so there are a few spots along here where you could park for better-than-average taxiway shots (e.g. G); however, the sun is in your face until late afternoon, and parking can be a problem. Shortly after a fairly sharp left hand turn, there's a lane leading off to the right. This leads to another crash gate (H) with similar photo opportunities for taxiing aircraft. On the rare occasions when runway 10/28 is in use, passable shots of landing/departing aircraft may be possible here too with a large lens. Back to the road, turn right and continue, and you'll soon come to another lane on the right, which leads to another crash gate (I). Again on the rare times that 10/28 is in use, this is a good place for shots of anything landing on 10 or, to a lesser extent, departing from 28 - depending of course where you position yourself along this lane. Plenty of room to park at the beginning and end of the lane. There are also views of the 12 Squadron hangar complex to the North; not much use for photos because of various obstructions but you may get a few serials if anything is left outside - of course if they come out to taxi you can get photos at other spots as they taxi to the runway. Back down the lane and turn right to get back onto the road. You'll pass a left hand turn off and come to a crossroads, with a road to the left and lane to the right. Take the right; this leads to yet another crash gate (J) which offers some limited and distant views of the hangar complexes. Might be useful for serials but unlikely to be useful for photography; the area near here has been used as a dump in the past and has seen sad looking Gannets and Buccaneers awaiting their fate. Back down this lane, turn right once again and when you come to the junction with the B9040, take a right, signposted for Lossiemouth. The road curves gently to the right, then begins to curve left. At this point you'll see a track leading straight ahead, and a sharp right turn into a lane. Take this and you'll go alongside the station perimeter fence, near the hangars (K). Again of limited use for photography, but you should be able to read off some serials if anything is left outside. Back to the road and take a sharp right to go along the track past a crash gate on your right. Now you're best off parking as soon as you can, because the track gets progressively poorer in quality and overgrown - recently the worst of the bushes have been cleared but the quality of the track and remaining vegetation could leave you with a nicely scratched car. It used to be the main road, running on an embankment, but was closed and the road diverted further North and lower down to leave the approach to runway 23 clearer. The result is a raised viewpoint across the airfield and nearby golf course, and one of the best viewpoints at any airfield. From here (L) you have superb views of anything on approach to 23 (except early in the morning) and a clear view across the airfield; good for logging serials of anything on the visitor's ramp in particular, though binoculars or a telescope are a must. Departure shots are possible but aircraft are often quite high by this point. Walk further East on the track (you'll probably have to go down the embankment onto the rough of the golf course) and you'll soon find yourself lined up with the end of the runway (M), giving good head-on shots of anything on approach to runway 23, and perhaps passable departure shots from 05. You can actually drive up to this point but it does get very narrow and turning at the end is tricky! For the next spot you can either simply continue walking and go back up the embankment when it looks less overgrown, or go back to the car and get back onto the main road, continuing East through the golf course. There is a lane used by golf carts that goes towards the runway but it's apparently blocked now, so continue further on the road and you can take a sharp right to go back towards the runway on an old concreted path which runs to a crash gate (N) - room for only two or three cars to park up here though. From this spot you have again excellent views of anything on approach; there's also an old pill box nearby which can provide an elevated viewpoint, though it gets very cold and windy. In poor weather it can also provide shelter, though the regular use of the pillbox as a toilet means you may prefer to stay out in the rain! Early in the morning you can get good shots of anything taxiing from the visitor's ramp (itself partially obscured by a hangar) onto runway 23, if 23 is in use of course. However later in the day the sun ruins your chance of a decent shot. A 100-200mm class lens should do fine. Given that you're on the edge of the golf course here, if you walk any further North you're in the 'rough' - a sort of no-man's land between the greens themselves and land outside the course. The club members seem fairly tolerant of the odd spotter in the rough, but bear in mind you're on the golf club's property and you can be asked to leave - you can also be hit by a golf ball, and wouldn't have a leg to stand on if you tried to complain about that! Back to the car and continue on the B9040 towards Lossiemouth, turning right onto the B9135, signposted for RAF Lossiemouth. You'll come to a roundabout; on the right is the station entrance and you can always try asking if you can take a picture of the gate guard Tornado (O). However it's quite a way within the station entrance, and results when asking permission are mixed - I was refused, but I know someone else who was escorted right up to it and allowed to take as many pictures as he wanted! Anyway, back to the roundabout - if you didn't bother with the gate guard, keep going straight, if you're coming out of the station, turn right. Continue on the B9135 towards Elgin and as the road curves to the left you're near the end of runway 10/28. If it's in use you may be able to find somewhere along here (P) to park without obstructing the road and get decent shots of the aircraft - unfortunately the profusion of double yellow lines means the police will soon move you on even if you're parked on the verge. So that's your lot for Lossie! Petrol stations and lots of shops and chippies etc. in Lossiemouth town. Nice beach too, so if you're encumbered by kids/other half/both, you can always dump them there for the day. The Silver Sands Caravan Park and campsite is next to the beach and golf course and apparently very good - the entrance is about 250 m from the track that takes you to point K, and it's the place to stay if you want to watch movements from your caravan or tent! Contributors: Mike Tighe, Matthew Easton, author, Simon Brooke, John Caie, Sandy Abel, Michael Anderson, Garry Lakin, Nick Challoner, Alistair Henderson, Mike Riach, Brian Elliott, Michael Stephens, Malcolm Spaven.